(The promised post on Josef Gärtz's new job will show up in three weeks--on September 20th). Churches in my family’s past were centers of faith and community, but for me they have been sources of revelations. Not the kind found in the last book of the Bible, but rather as repositories of family secrets that have only recently come to light. 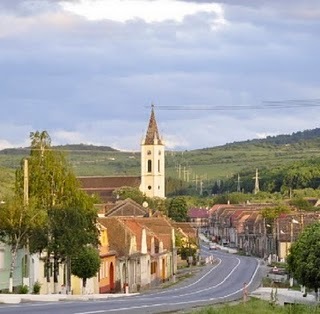 Before they came to America, my grandparents each attended an Evangelical Lutheran Church in their respective home towns in Siebenbürgen -- the area we call Transylvania. Their ties to these churches was represented in the identical hymnals they each thought important enough to bring with them to America. The title on both was "Gesangbuch" literally, “song book”), and the title pages were stamped with the following: “Evangelical Land Church in the Siebenbürgen Section of Hungary,” indicating the area in which both churches resided. These churches contained a wealth of family history, but my brothers and I had no clue as to these treasures until our 2007 roots-finding trip to Romania. She was the mother of my grandmother, Lisi, who was 10 at her death. My grandmother’s church in Grosspold held a Familien Buch -- Family Book, in which we learned of her parents’ marriage, and the losses my grandmother suffered of her siblings and her mother, and the subsequent remarriage of her father, Samuel. (See: Life and Death Abbreviated). 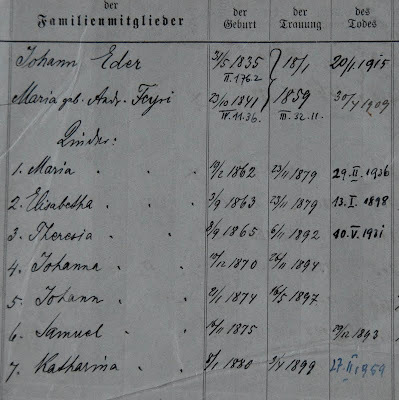 Even Lisi's grandmother Maria's 1859 marriage to Johann Eder and their children 's lives (see right) had been recorded in that book. My grandfather, Josef’s, church in nearby Neppendorf, was a trove of surprises. Tucked into the back of this church was a small museum of ethnic German life. There my brothers and I discovered three family photographs, identical to ones we had in our own collection, gracing its walls! (See Spilling Secrets). 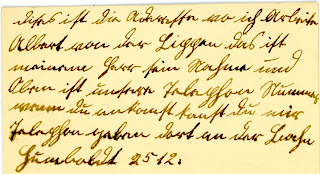 A former pastor at the Neppendorf Lutheran Church had researched and created genealogies for many of the members, including the Gärtz family. For the first time, I learned that Josef Gärtz’s ancestors had originally come to Siebenbürgen/Transylvania from a town called Gerstheim in the lower Rhine (Niederrhein) region of Alsace, at that time, as now, a part of France. Gerstheim, like so many towns in this oft-fought-over border area between France and Germany, was populated by Germans. We had known none of this. Could we have faith in the pastor's research? That left us with the impression that this “Michael Gerz" which the document noted was born in “1771,” came as an adult to Gerstheim. 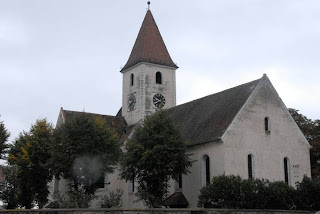 Yet another Evangelical Lutheran Church, this time in Gerstheim -- came to prove several pieces of the Neppendorf-recorded genealogy, to be wrong! Faith only goes so far! 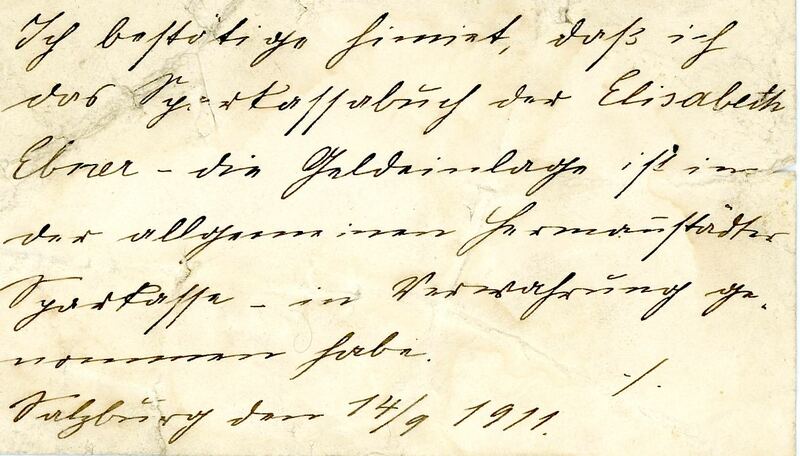 In the next few weeks, we'll go back in time, to the 18th Century, to find out what the Gerstheim church records had to say about which of Josef Gärtz's ancestors made the 1,000 mile trek from France to Siebenbürgen, then in Hungary, and why "it takes a village" to find an ancestor. We'll check back in a few weeks with Josef Gärtz and his new job in a Chicago Saloon, which gave him and Lisi the foundation for their future. 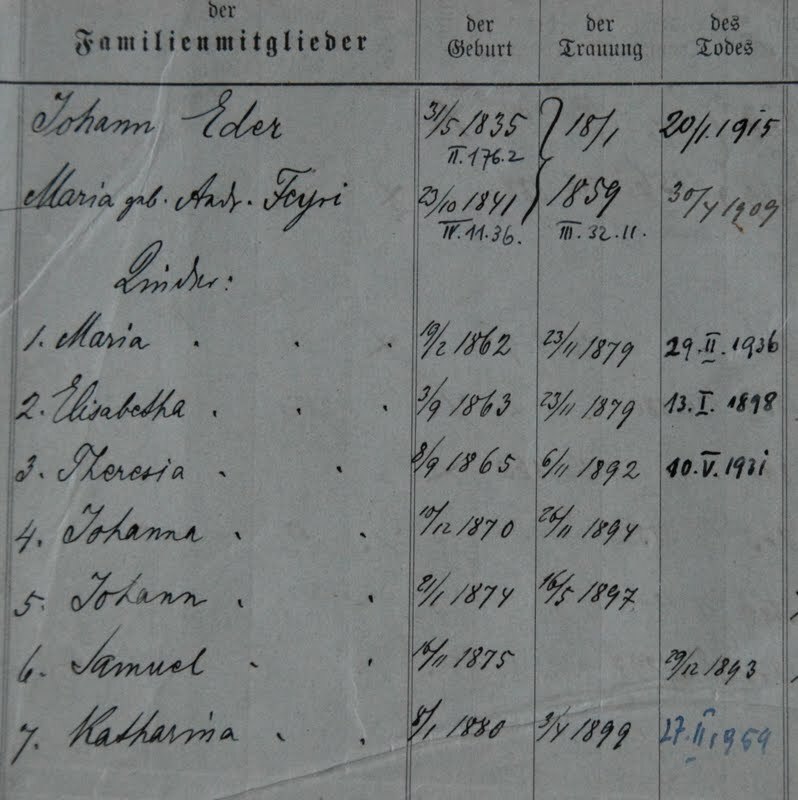 But first -- another immigrant family -- Josef's great-great-grandfather, who traveled the prodigious distance from Alsace to Siebenbürgen, and how I teased out the facts with help from my "village." Friends: I won't have access to my computer for the next two posts, so I hope you'll check in, as usual, on Tuesdays, to see how I unravelled many contradictions I found in the Neppendorf Church records. Labels: American Immigration, family history, Genealogy, memoir, Siebenbürgen. Introducing Mr. and Mrs. Josef Gartz. Downright Immoral! Unseemly! Wrong! In 1911 that would have been the reaction if Elisabetha Ebner lived by herself upon arriving in Chicago (only “bad” girls did that), and moving in with her future husband, Josef, in Chicago was out of the question! But she hadn’t come 5,000 miles to second guess her decision to marry Josef. No. 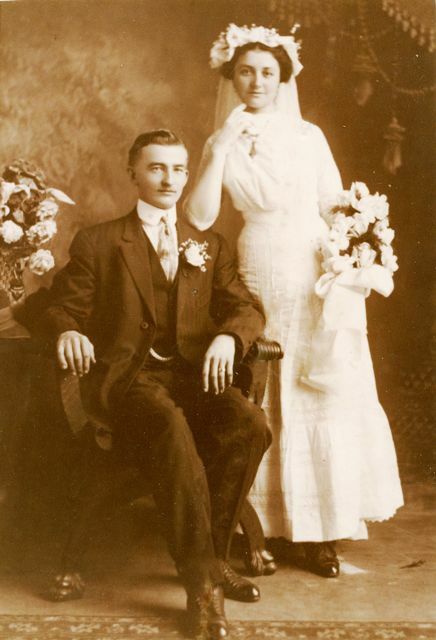 They were married within two days of her arrival in Chicago. But how did it come about? I found out in a “letter” she wrote to Lisbeth Plattner, née Jickeli, the little girl she had cared for back in Transylvania.The letter was dated September 25, 1972, sixty-one years and a day after Lisi had stepped off her ship, the Kaiser Wilhelm II, in New York. That little girl was by now a 70-year old woman, with grandchildren of her own, and she and Lisi were still corresponding! But why did I have a letter that should have already been mailed? Lisi labeled this “letter.” “An der Rolle.” On the roll? What could that mean? Lisi thanked Lisbeth for an audio tape she had sent to Lisi and her family. “Thank you so much for the 'Rolle' with your voice.” Aha-- now I knew. Lisbeth had sent Lisi a tape so now my grandmother was going to send one in return, but first she had written out a script for herself to be sure to say exactly what she wanted. Hence “on the roll,” the roll of audio-tape. and husband, left. Perhaps George Fleischer, the witness, right, but not sure. 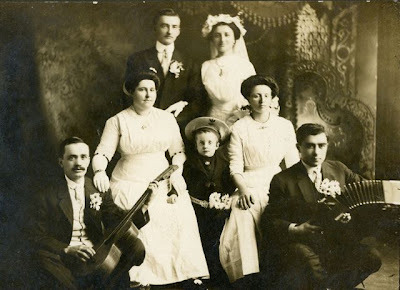 When I first came to Chicago, my husband had a two-room apartment and a Neppendorf [my grandfather’s hometown in Transylvania] man paid him to sleep there. [Josef] made only 7 dollars a week and worked every day from 5:00 in the morning until 7:00 in the evening and also received meals. On October 11, I arrived in Chicago and rented a bed with a woman neighbor until October 13th, a Friday. In the morning my husband went to work as always at 5:00 am until 3 in the afternoon. Then he came home with the Neppendorf man and we three went to the judge. There was a pastor who blessed us in marriage. George Fleischer [perhaps the Neppendorf man] was witness. On October 14-15, my husband went to work from 5:00 a.m. to 7:00 pm as usual. Then on October 16th I began a job as a cook in a restaurant from 6:00 a.m. to 6:00 pm for six dollars per week, meals included. We always had work -- even when those born in America didn’t. Sound familiar? The hardworking immigrant willing to do whatever was necessary to get and keep a job, not so different from what we see today. It wasn’t long before Josef was able to double his salary. A photo of him at his job, coming up. This business card from my grandmother's employer, Mrs. Jickeli, was among the documents I ignored for a while. I put off finding out what was written on the back (see below) because I was putting my time into deciphering and translating old letters, which seemed so much more important. 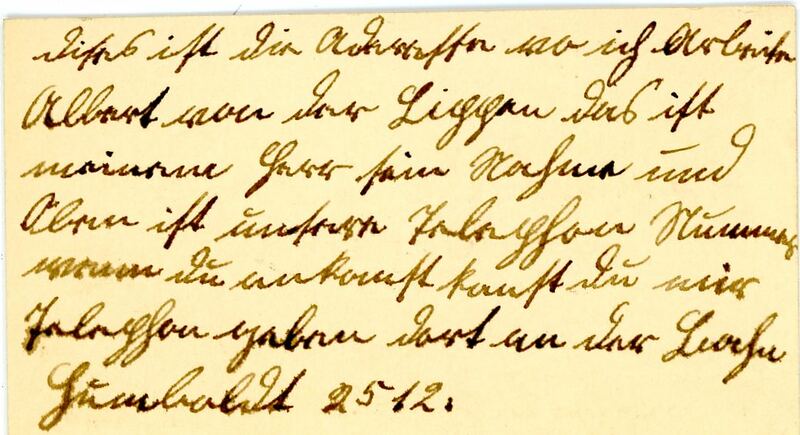 I could read the date at the end, 9/14/1911, and figured Mrs. Jickeli must have given it to Lisi just before Lisi had boarded the train from Hermannstadt to the port of Bremen. (See The Train Journey-Part II. To Catch a Ship). I wondered just what Mrs. Jickeli would have written to Lisi on the back of this card, as they said their sad goodbyes. Was it a fond farewell? A "be safe and write?" Actually it was far more practical. It was a promise to safeguard Lisi's hard-earned money--savings she may have to ask Mrs. Jickeli to send to her in America. I hereby acknowledge that I have taken for safekeeping Elisabeth Ebner’s bank book of [her] deposits in the Hermannstadt General Savings Bank. Of course this is “Bad Salzburg,” (Salzburg baths, near Sibiu/Hermannstadt in Transylvania--not Salzburg, Austria), where Mrs. Jickeli had her summer home. As Lisi disembarked from the Kaiser Wilhelm II, she probably carried this card tucked safely into her wallet--knowing her money was in safe hands. After visiting with her step-sister, Maria Wagner, in Cleveland, Lisi began the final leg of her journey--a train to Chicago to meet up with her sweetheart, my grandfather, Josef. But how would they connect in that big, bustling city? Another business card I had passed over because of its seeming insignificance, ended up being very significant. 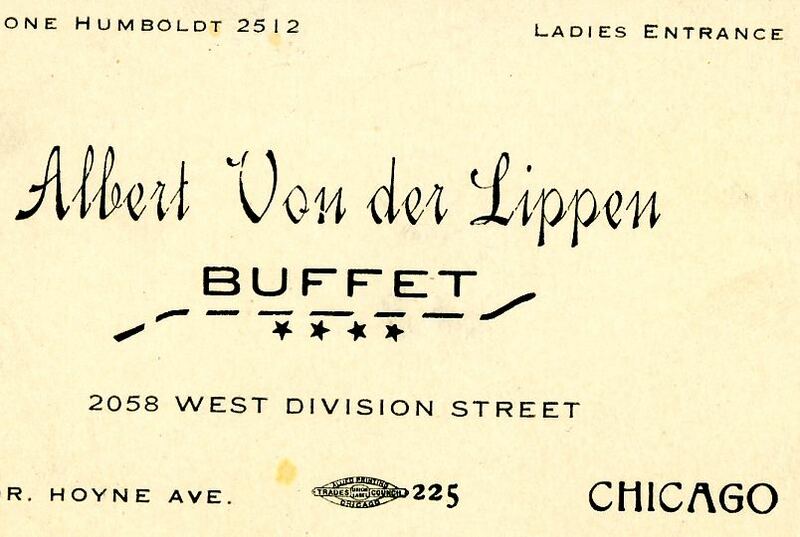 I looked at the Albert Von der Lippen Buffet card several times and wondered: Was it a favorite place for my grandparents to eat? (Didn’t make sense -- they were too frugal to eat out). Was it the card of a friend? Was it a landmark of sorts? The Buffet that smoothed the way to Josef’s arms. Instead, this little buffet business card turned out to be a major clue to my grandparents’ reunion in Chicago. I wouldn’t know that until I finally sent a scan to my "Rosetta Stone," 90-year-old-Meta, in Germany. She deciphered the short note on the back. This is the address where I work: Albert von der Lippen is my boss’s name and above is our telephone number. When you arrive at the train station you can call me at Humboldt 2512. She arrived in Chicago on October 11th, and two days later, they were married. How do I know? My grandmother wrote a script before tape-recording the details of her first days in Chicago. Coming up. Central Park, NY 1911. I've arrived! back onto the front, under the photo, as you can see, above. 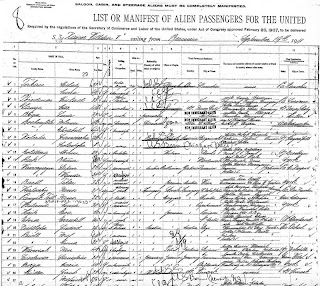 The ship's manifest (see last post: An Alien Made Manifest) showed us Lisi Ebner, my grandmother, was headed to Cleveland first to visit her stepsister, Maria Wagner, before traveling to Chicago to meet and marry her sweetheart, Josef Gartz, my grandfather. 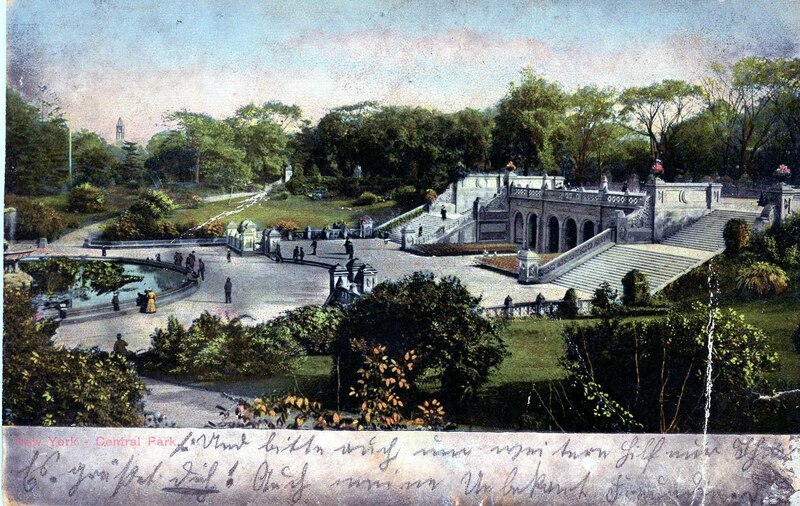 But before she leaves New York, she sends Josef this cool postcard of Central Park, NY, which, we learned from her diary, (see post: From Ship to American Soil she had bought on the ship before even landing in New York. I've learned one can't always trust the what our ancestors' notes say. For example. Several years later, my grandmother must have been going through all she had saved and saw this postcard. She wanted to make a note as to its significance. 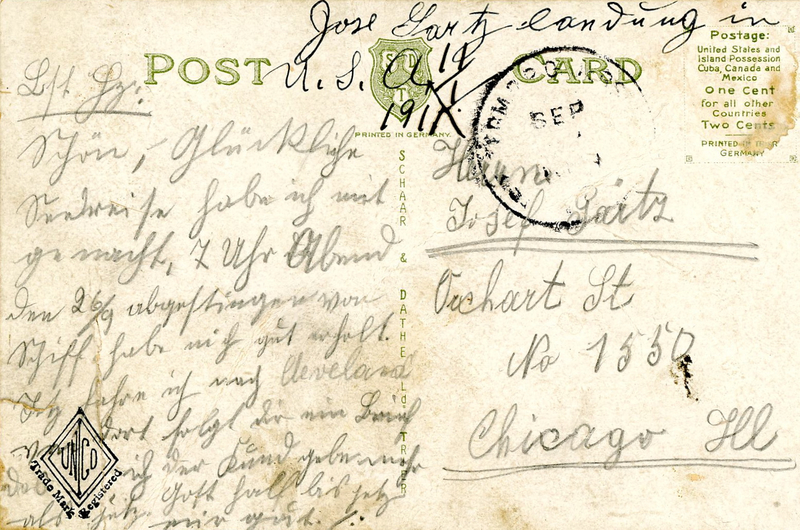 Perhaps in her overworked state, she just quickly, without even looking at the card, marked it "Jose[f] Gartz landing in USA Jan 14, 1911." [He actually landed on Jan. 11th]. But the card is postmarked "Sep[tember]." But this missive is definitely from Lisi to Josef after her arrival in New York on September 26, 1911. Chicago, Ill. The postage required (upper right) 1 cent. Note added writing (darker) near the top. I had a beautiful and lucky trip over the ocean. I disembarked from the ship on September 26 and I have recuperated [from the journey]. Now I’ll travel to Cleveland and from there I’ll write you more than is on this postcard. God has helped me well thus far and I pray that he also gives more help to my darling [Josef] in the future. I send you greetings and also to my unknown friend. I was confused as to who this “unknown friend" was. But ninety-year-old Meta, who decodes the old German script, knew! 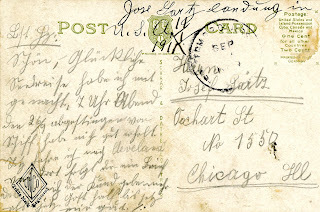 She referred me back to Josef’s letter to Lisi sent from Cleveland and dated January 29, 1911 (see post Love Finds a Way). The "unknown friend" was Mrs. (Frau) Beer. Josef was staying either with the Beer family, or near enough that Mrs. Beer knew both Josef's habits of neatness as well as his appeal to other women! 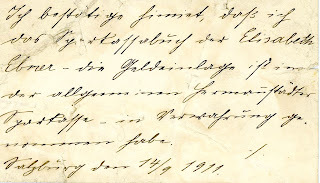 After Josef finished his message to Lisi, Frau Beer wrote a few words on the same letter, referring to Lisi as her "unknown friend" and exhorting her to come to America to marry Josef. Mr. And Mrs. Beer must also have moved to Chicago from Cleveland, just as Josef did, sometime between March and May, 1911. Why? Because Lisi asks Josef to greet Mrs. Beer, the "unknown friend" (and he's in Chicago) and also because the Beers will play a role in Josef and Lisi’s future in Chicago. How a seemingly insignificant business card led me to discover where Josef worked in Chicago how Lisi was able to find him upon her arrival in this bustling, crowded city. just as they were embarking on their wholly unknown future in a foreign land--the U.S.A. The manifest allows us to look back upon our ancestors through the eyes of one of the first officials to welcome (and scrutinize) them as they stood before the officer, undoubtedly with heart in throat, wondering if anything they said might provide an excuse to send them back whence they came. 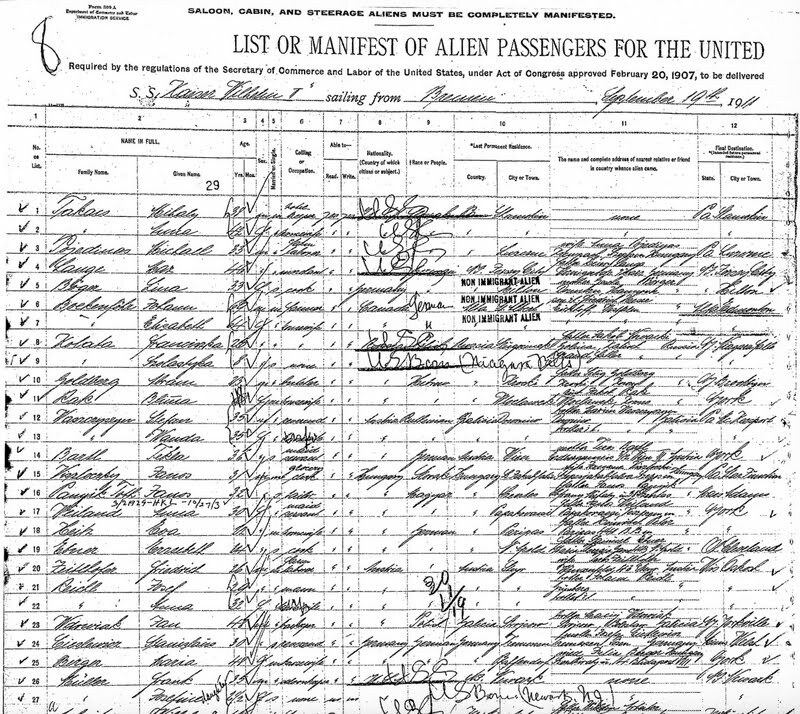 Whoever looked at my grandmother, Lisi, when she arrived on the evening of September 26th, 1911, began filling in the twenty-nine columns on line 19 of the manifest with the details that the U.S. wanted to know about this "alien" prior to her entry into this country. Aha! Question #12, the last question on the first page of the two-page manifest, is how I discovered that Lisi didn’t go directly to Chicago to meet my grandfather. Instead her first stop was Cleveland, where her stepsister, Maria Wagner, lived. I hadn’t known this before. Is she’s a polygamist? No. (Who would answer “yes” to these two questions?! Rudolf Wagner [her stepsister’s husband] 4287 St. Clair Avenue, Cleveland, Ohio. I had seen that name before, and this piece of unknown information on the manifest was a revelation that connected Lisi's arrival to an incident forty years later. I had never met the Wagner family--nor do I recall hearing about them--until I read my father's 1950 diary. During one of his many business trips out of state, he traveled to Ohio and made a side excursion to visit the Wagner family in Cleveland. By 1950 they had grown sons, owned a restaurant where the sons and father switched off to work night and day, and had many American luxuries. Another immigrant family that had fulfilled the American dream. Details to come. Meantime, Lisi successfully passed inspection, both health and moral (no polygamy or anarchism!). Josef will have to wait a few more weeks to see his darling, but she let him know she had arrived safely. Coming up: the postcard of New York Lisi sent to him and how a seemingly unimportant business card turned out to be a key clue as to how they connected in Chicago.